Only the ignorant believe that science is validated through consensus. In the case of global warming, the consensus has achieved a useful mass with all the earmarks of a religious cult. Because of its mass, responsible corporations use warming as a marketing gimmick, and reasonable conservatives, like Newt Gingrich, have decided to join the marketing bandwagon. It is a fascinating stage play reminiscent of Galileo, who declared that the earth rotates around the sun, an inconvenient discovery for the power brokers of his day. Unfortunately the religious consensus at the time, the Catholic Church, felt that such heresy was demeaning to man as the center of the universe. Galileo was forced, by the consensus, to recant his scientific discovery as an alternative to the guillotine. Being of sound mind he chose to retain his sound body, and joined the scientific consensus of his era. Today’s consensus believes that man is contributing to global warming, and that unless this trend is halted, we will all roast in hell, or drown in rising sea levels. These inevitable events will occur at some time during the next 500 to 10,000 years, sealing our inevitable fate! This dim-witted consensus has convinced our elected representatives that unless we tax ourselves into submission immediately, our children will all perish from the face of the earth. In the name of sanity, I offer a totally different perspective on the science of the global warming lunatics, popularly known as the climate change or green brigade. My conviction is based upon scientific improbability, recorded inferential data from the past two million years, and a value-driven comparison of the consequences of both global warming and global cooling. I represent a consensus of one, and know that the following arguments are both scientifically sound, and compelling. For those of you with working brain cells, the arguments are not difficult. The graph is based upon real measurements taken from ice cores up to two million years of age. The graph’s peaks represent ice ages (more ice), while the valleys are periods of warming (less ice). The graph covers the most recent third of the last two-million years, or 750 thousand years. On a Chinese time line, the graph must be read from right to left. We are currently on the extreme left on the graph, which shows -2 degrees Fahrenheit. As this is an ice graph, the -2 actually represents warming by two degrees, or less ice. We are currently at the peak of the less ice period. Assuming the cycles will continue to repeat for the next two million years, it follows that at some time during the next 10,000 years, the cycle will turn cold again regardless of what we do. If man actually has the power to control either warming or cooling, it has yet to be proven through actual data. Man’s appearance in significant numbers on earth is documented for only the warming portion of the 60th cycle. The first 59 of these cycles occurred before man placed many footprints on the earth’s surface. This, of course, does not prove that man is not contributing to global warming today. It does prove that 59 comparable warming and cooling cycles occurred before he appeared, with his small brain, on the face of the earth. Given this indisputable data, what accounts for the earlier 59 cycles of global warming and cooling when man was not around? As a reasonable person, I prefer that the first 59 cycles be explained by reasoning scientists before any lunatic consensus throws man into the pressure cooker. Until reputable scientists can explain the previous cycles, I am unwilling to accept that man is in any way responsible for global warming during the current cycle. This inane assertion, in the absence of scientific proof, smells like Chicken Little all over again. This brings us to cycle number 60, a period of 33,333 years, the last, and most current of these 60 cycles. This is the only period during which man may be blamed for any warming at all. Using the jargon of the scientific community, the following is the appropriate research hypothesis: Given sixty known periods of climate change within the past 2,000,000 years, calculate exactly what distinguishes the last, 60th cycle, from all the previous 59 cycles. In the name of fairness, I will give scientists 50 years to produce the answers. Then I will give the dim-wits in the consensus another two-hundred years to accept the findings. As scientists don’t yet know what caused any of these 60 cycles, to blame man amounts to spitting in the earth’s greenhouse. There is actually very good news from the above ice chart. We are currently in the deepest valley of the normal temperature variability for these cycles. The earth is statistically not likely to get much warmer than it is right now. The warming cycle has peaked, and may well remain at this peak for many thousand years. During this period, it is likely that the aging population of the entire east coast will migrate south to Florida, where old folks bask in the sun and turn the interstates into parking lots. The warm end of the ice cycle is conducive to outdoor living, growing an incredible array of edibles, animals, and beauty, and enjoying the marvelous environment that comes with warmer temperatures. The sky is falling alarmism, in the absence of scientific proof, comes from a hodge-podge of wishful thinking by those who would like to control the earth and all its creatures. The presumed plight of the polar bear is a key example. One might think that the bears’ habitat is limited exclusively to ice shelves, and that free-floating ice in the arctic is essential to the bears’ survival. The bear is far more flexible, versatile, and adaptable then all of the environmentalists combined. The bear actually walks on land, swims in the oceans and lakes, feeds on fish in both fresh and salt water, and will devour any environmentalist who strays into his frigid habitat. The polar bear population has multiplied many times over through man’s thoughtful efforts over the past fifty years, a singular success story based upon prudent management. The bear worshipers will never admit this singular success story. In spite of evidence to the contrary, the consensus has placed the poor polar bear back onto the list of threatened worldly creatures!! The Warming Data: If the earth were only a human body, we could place a thermometer under the tongue, or where the sun don’t shine, and read the height of the mercury on the gauge. A temperature of 98.6 degrees Fahrenheit, give or take a degree, would be within normal limits. Unfortunately, on the earth, a thermometer under the tongue produces a gusher of molten lava, and finding a place where the sun doesn’t shine is uninhabitable. A single number that represents the temperature of the earth is a statistically contrived notion one step removed from earth’s reality. Given known variation in the earth’s temperature over the last 2,000,000 years, it makes sense statistically to assign such variation to normal limits (or W.N.L., within normal limits). As measured and inferred variation has occurred both up and down the temperature scale by 4 degrees Fahrenheit (+2 and -2), it follows that such variation is the usual, expected, and healthy limits of worldly temperature. Until such time as the world’s temperature falls significantly outside of this expected normal range, any attempts to control, cap, or manage its climate is a sign of lunacy, grandiosity, or both. Cold Earth Versus Warm Earth: On the face of it, there is little reason to be concerned about marginal variation in global temperatures over the next 500 years. By contrast, the ice age data and objective scenes which may be envisioned from the earth’s natural temperature cycles present a frightening alternative to global warming. If you believe that global warming is a dreaded eventuality, an ice age is a serious downer that should be avoided at all costs. Those of you concerned with man’s carbon footprint will rot in hell when the ice age arrives, and we are not prepared. 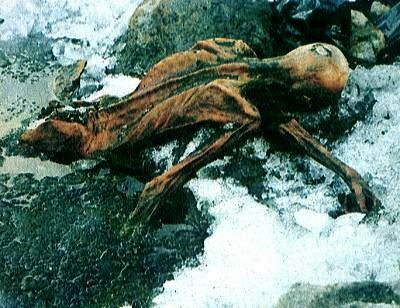 The following photograph is of the ice mummy, who was recovered, in a manner of speaking, from a glacial environment between Switzerland and Italy a few years back. As the glacier thawed, thanks to global warming, the mummy came into partial view, revealing that his complete remains were almost as they were when he died 3,300 years earlier. This, in itself, is not particularly alarming. It does open up the substantial difference between living in Florida during retirement, and living with the glaciers in the Alps in the year 1,300bc. The frightening part is what extrapolation contributes to this picture from the ice ages, as suggested, but not clearly visualized in the ice age chart above. During one of the more recent ice cycles, the border between the states of Kansas and Nebraska was covered by an ice shelf, a permanent glacier. This glacier was not one which appeared every winter and conveniently disappeared every spring, allowing the local farmers to plant wheat or pump oil. This glacier was planted in the precise middle of America’s bread basket, a primary source of food and energy for the entire planet. As for the seriousness of the glacier itself, it is currently estimated to have risen 600 feet above the land along the border between these two states. One may infer, conclude, and extrapolate from this scientific data that nothing was growing within the heart of the fertile Mississippi Valley for many thousand years. Nothing grows on a glacier, except the polar bear, and when the earth is covered by a glacier, all life as we know it ceases. What is left of humanity, at that time in the earth’s geologic history, is perfectly preserved much like the ice man, as pictured above. Man’s survival on earth for all eternity is clearly a myth. Protecting the earth’s environment in its natural state is also a myth, as earth has no natural state, but is constantly changing. What is not a myth is the clear contrast of surviving and prospering on a warm earth or a cold earth. The warm, mother-earth is, on balance, a gift in the sunshine. When the earth freezes over the environmentalists will be struggling to find some renewable resource to keep them warm. To their dismay, the only renewable resource on a glacier is the polar bear. Bye! Bye! environmentalists, and thank God for small favors! As for global warming: bring it on!